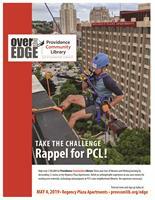 PVD Businesses: Send Your Fearless Leaders Over the Edge to Rappel for PCL! Providence Community Library (PCL) will partner with Over the Edge and Regency Plaza Apartments for a second year to create Rappel for PCL, a truly memorable fundraising experience that should have pride of place on anyone’s bucket list! Individuals and teams will rappel down the 150 feet high Regency Plaza Apartments building on Saturday, May 4, to help raise $100,000 for the nine neighborhood locations of Rhode Island’s largest library system. Visit the event page to reserve a spot and create a personal or team fundraising page that will enable friends, family, and colleagues to donate funds toward their rappelling adventure. No previous experience of climbing or rappelling is necessary! Businesses and organizations can take advantage of a range of sponsorship opportunities and/or send a team of three or more Fearless Leaders over the edge. PCL will provide such teams with a range of fundraising resources and document their rappelling adventure through images and videos that can shared online or shown at company retreats, annual meetings and other events. PCL, a 501(c)(3) not-for-profit organization, is the largest library system in Rhode Island. Three regional libraries, Rochambeau on the East Side, Mount Pleasant on the West Side and Knight Memorial on the South Side serve larger areas of the city, while Fox Point, Smith Hill, Washington Park, South Providence, Olneyville and Wanskuck serve the needs of smaller, diverse neighborhoods. PCL provides 51,000 patrons with materials, resources and services, programs, free computer and internet access and much more. Over The Edge is a special events company that provides signature events for non-profit organizations anywhere in North America and it is currently expanding globally. Business leaders, individuals and community members are invited to raise donations in exchange for the experience of going "over the edge" of a local building. Over The Edge to date has raised over $70 Million for non-profits around the world.